Mrs. Cervantes has been teaching for 14 years and to this day continues to love and be grateful for the job she feels blessed to have. Being a teacher, like any other job, has both good and bad qualities. It can be stressful, frustrating, and tiring at times, but any person who truly loves their job understands that, overall, the great moments outweigh the bad ones. One of the good qualities of teaching is the day to day connections teachers make with their students. Mrs. Cervantes speaks about how making a connection with the students and watching them go through their journeys through high school is what makes her job worthwhile. All journey’s, like her own, have a beginning and she loves having the opportunity to become a part of someone else’s and push them to achieve what they may not have believed possible. Everyone has their own story, a story to tell the younger generations to teach them the values of life and everything in it. 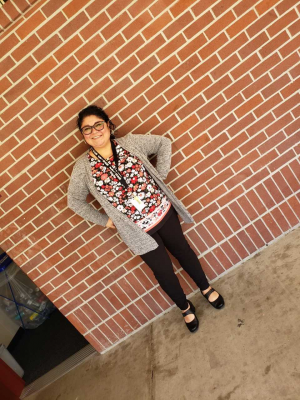 Mrs. Cervantes’s journey is a complicated one but overall provided her with a tremendous amount of life lessons that helped form her into the person she is today. At a young age, Mrs. Cervantes was faced with many obstacles to overcome. Living in a single parent family made it difficult for her to do many of the things today’s youth find so simple. At the age of 8, she began working in fields with her mother to provide another source of income for her family. A child with dreams of becoming a dancer began early but made it incredibly difficult for her to attend school. She started missing school for months at a time which overall ended with her unable to graduate from Tracy High. Like all students after high school, she faced a question, “What do I do now?” After some thought, she decided to follow one of her many dreams and became a hair stylist. At the age of 19 she entered cosmetology school, and after a year of studying came out a registered hair stylist. She then spent eight years working hard at a small salon in Stockton attempting to make a living, often getting rides from her boss to work due to the lack of owning a car herself. After those many years working at this salon, she made a decision that would ultimately change her life forever. Cervantes decided to go back to school to get her degree and, overall, have a chance to live a more comfortable life. Although she was offered an opportunity to become the “owner” of the very salon where she worked, she ultimately decided her mind and heart were set on obtaining a higher form of education. At the age of 27, Cervantes enrolled at Delta Junior College in Stockton, California and began her journey to become the person she is today. She attended Delta for two years then transferred to CSU Stanislaus to finish school and obtain her degrees in Social Science, Geography, and Political Science. Finally, with these degrees, she began working to become a teacher. Her first teaching position was at a small elementary school in Stockton Unified. She taught for only a year there then was offered a job at Weston Ranch High School in 2006. 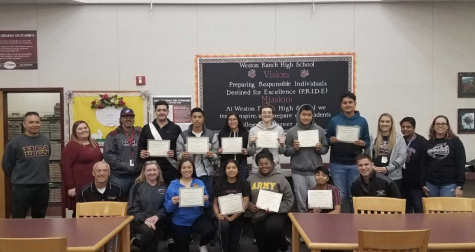 From that point on, Mrs. Cervantes had finally found her place in teaching and for the past 13 years has become one of Weston Ranch’s favorite teachers. Even after the long road to get here, and thirteen years in the classroom, Mrs. Cervantes does not plan on retiring any time soon and is eager every single year for the new batch of students entering her class. She has the same dream and goal as her colleagues: To see the students reach their potential. “I want to run into those future doctors, actors, musicians, lawyers, engineers, mothers, fathers who sat in my classroom and remember the impact I made in their lives,” she says. Hearing and walking her “journey” with her, I hope students can learn from her early struggles and know they can achieve more than they believe they can. Life is a bumpy road, but if you are willing to keep your head up and push through the challenges, the outcome will always be a happy story to tell. The Prowl wishes to thank Mrs. Cervantes for her honesty and candor. We truly appreciate her story and are proud to call her our teacher.